The new Qualcomm Snapdragon 710 aims to make premium smartphone features less expensive. The 710 touts significant performance and battery life improvements compared to the Snapdragon 660. Smartphone manufacturers already have access to the chip, and we should see the first devices using the 710 within the coming weeks. 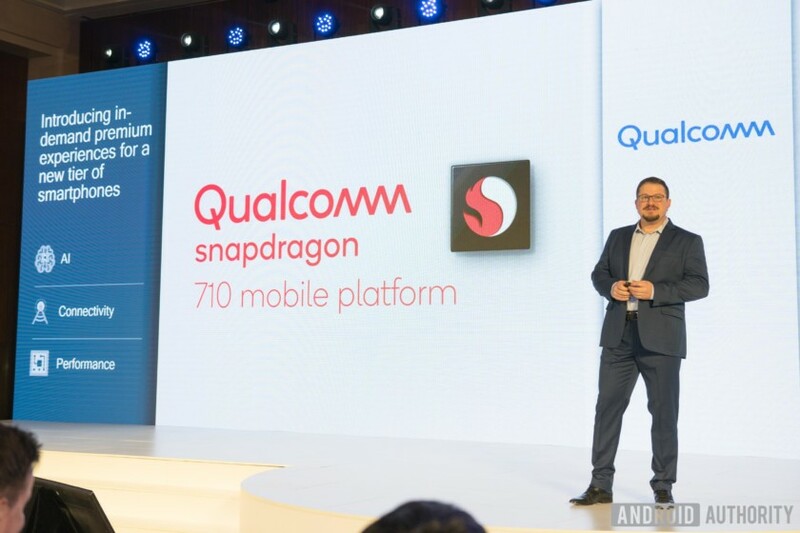 Qualcomm has just unveiled the Snapdragon 710, the first entry in its recently announced 700 mobile platform series. There are a number of optimizations which should help the Snapdragon 710 make premium smartphone features more accessible via mid-range devices. Qualcomm states that the Snapdragon 710 was designed around the most popular consumer use cases. You can expect a two-fold increase in overall AI performance compared to the Snapdragon 660, stronger image processing thanks to added hardware acceleration, as well as reduced power consumption. For example, you’ll be able to capture 4K HDR video with 40% less power consumption than 4K SDR capture with the 660. Clearly, the Qualcomm Snapdragon 710 fits comfortably between the mid-range 600 and high-end 800 series. The 710’s custom Kryo 360 CPU really highlights this position. In an unprecedented move, Qualcomm has designed the octa-core chip with two 2.2GHz ARM Cortex-A75 cores for performance and six 1.7GHz ARM Cortex-A55 cores for efficiency. There’s admittedly a lot to dissect from the specifications. Perhaps most notably, the Snapdragon 710 is the first non-800 platform to include a second generation Spectra image signal processor. The Spectra 250 enables quicker frame capture combined with added hardware acceleration. This should ultimately translate to better photos and videos. Of course, we cannot forget about the Adreno 616. Qualcomm states that this GPU will allow for up to 35% faster graphics rendering while consuming up to 40% less power. The Snapdragon 710 platform should provide a best-in-class gaming experience. Perhaps more so once you consider the growing number of game developers that work directly with Qualcomm to optimize their software. Unsurprisingly, the Snapdragon 710’s fresh hardware will also provide OEMs with greater opportunities to implement Artificial Intelligence features. Qualcomm’s Snapdragon Neural Processing SDK is particularly noteworthy. Essentially, it bridges the gap between the hardware and various AI frameworks. This SDK makes it much easier for OEMs to utilize frameworks like Facebook’s Caffe and Google’s TensorFlow. Are you interested in the type of features that this AI engine will enable? Well, be sure to stay tuned for additional coverage as we’ll be hearing much more about AI very soon. The Qualcomm Snapdragon 710 is similar to the MediaTek Helio P22 in that it’s also trying to bring premium features like AI capabilities to a lower price point. However, the chips have remarkably different capabilities. It seems that Mediatek is targeting a sub-$200 market with their Helio P22, where Qualcomm is simply trying to bring a no frills chip to the mid-range segment. It is nice to see Qualcomm target a specific mid-range yet premium tier with the Snapdragon 700 series. Now it’s just up to smartphone manufacturers to harness the Snapdragon 710’s potential. Since it’s available immediately, Qualcomm says we can expect the first devices to ship in the coming weeks. You’ll definitely want to keep an eye out for those as well as additional related announcements.